I was surprised to see that someone cared enough about Heath Ledger to bedeck their car with a semi-permanent message. But I was more surprised that it was such an unprofessional, silly looking tribute to the dead actor. It could easily have been an advertisement for Signe’s Heaven Bound Bakery or one of those wretched bumper stickers that inform other motorists of the perils of driving faster than their angels could fly. You’d think something more somber and reserved would be appropriate. The only other thing adorning this SUV was one of those Jesus fish. So the two causes in this person’s life that they care passionately enough about to warrant brandishing on their vehicle are a) the son of God and b) Sir William Thatcher from A Knight’s Tale. 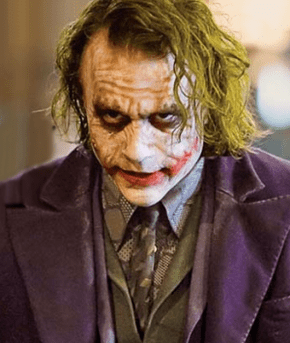 Here‘s the only thing I could find on the interweb of a Heath Ledger bumper sticker. Maybe this person was just part of the extensive viral marketing campaign for The Dark Knight. Regardless, I’m getting more and more damned excited for this movie by the day.